We first heard Michael Giacchino’s work on Pixar’s superhero movie The Incredibles (2004). The energetic score blew us away, and we knew that the American composer had big things coming his way. Besides becoming a trusted collaborator with directors like JJ Abrams (Star Trek Into Darkness) and Matt Reeves (War for the Planet of the Apes), he would also become a go to person for scoring Pixar movies. Ratatouille (2007), Up (2009) and Inside Out (2015) are excellent films, and music played a big part. One fine example is the “Married Life” cue which elevated the famous opening sequence of Up – the score won Giacchino an Academy Award for Best Original Score. We are hoping that the 50 year old musician will get recognised for his latest work on the musical fantasy film directed by Lee Unkrich. The score section of this highly recommended CD opens with “Will He Shoemaker”, and it sets the tone for the Mexican themed soundtrack. Bring on the guitars, strings and brasses – everything is festive and fun! The rhythms are infectious and listeners will have no problem enjoying the music. As the album progresses, Giacchino explores different emotions: from poignancy (“Miguel’s Got An Axe to Find”) and wonder (“Crossing the Marigold Bridge), to adventurous (“The Skeleton Key to Escape”) and celebratory (“Reunión Familiar de Rivera”). 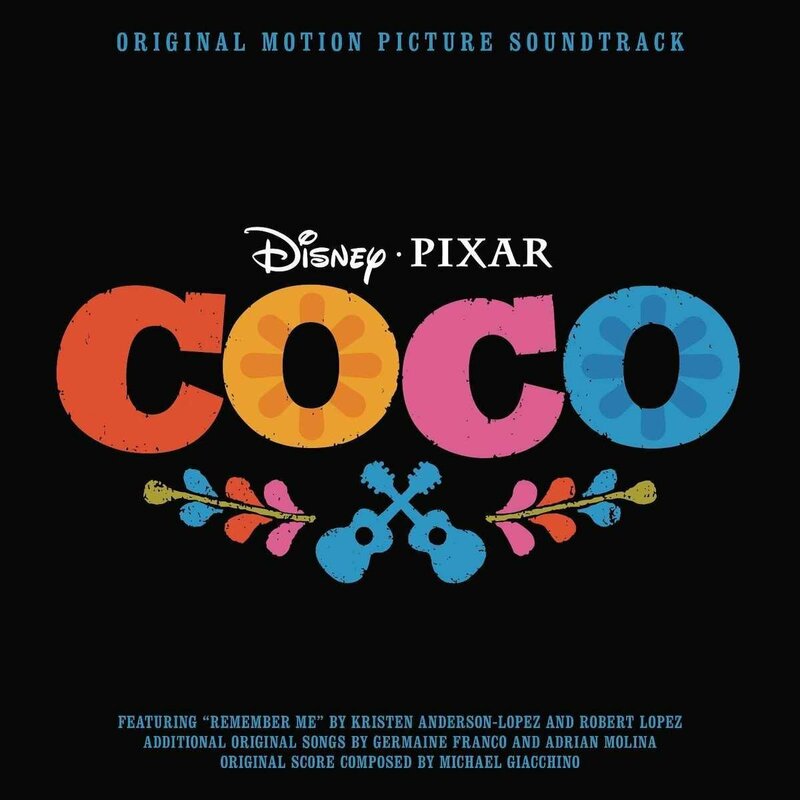 The gorgeous themes are nicely summed up in the last track "Coco – Día de los Muertos Suite". There are 73 generous minutes on this soundtrack, and about a third of it is dedicated to the songs from the film. Germaine Franco, Adrian Molina, Robert Lopez, and Kristen Anderson Lopez are the geniuses behind these tunes. The lovely ballad “Remember Me” has a few versions. Opening the album is the hilarious operatic “Remember Me (Ernesto de la Cruz)” performed by Benjamin Bratt (we won’t give away spoilers here), and there are the moving “Lullaby” and “Reunion” versions elsewhere in the CD. The producers wouldn’t forget a radio friendly rendition performed by Miguel featuring Natalia Lafourcade. Other songs like “Much Needed Advice”, “Un Poco Loco” and “Proud Corazón” will please fans who adored the movie too. There is a lot to love on this soundtrack, and you won’t be disappointed getting your hands on a copy.